Adults of today have less time on their hands. Juggling a 9-to-5 or even worse 9-to-who knows how late. People want faster, easier and more convenient ways of getting to their office, subway station or the grocery store. With cars jamming the roads and public transportation being delayed and not the most enjoyable environment to be in during the early morning rush, people are now turning to electric scooters which are gaining acceptance rapidly. Electric scooters are being viewed with hope as they provide the right blend of usefulness, convenience, portability, and power. For a long time considered to be a toy for kids and with their high weight, it’s only now that adults are looking at them as viable modes of transport and today it’s pretty common to see adults commuting on them. Most of us don’t live next to a bus stop or the train station. Generally, apartments and houses located near such hubs come at a premium because of the convenience they offer. Therefore, we are left with no alternative but to walk the often 10-15 or more minutes to the station or bus stop. 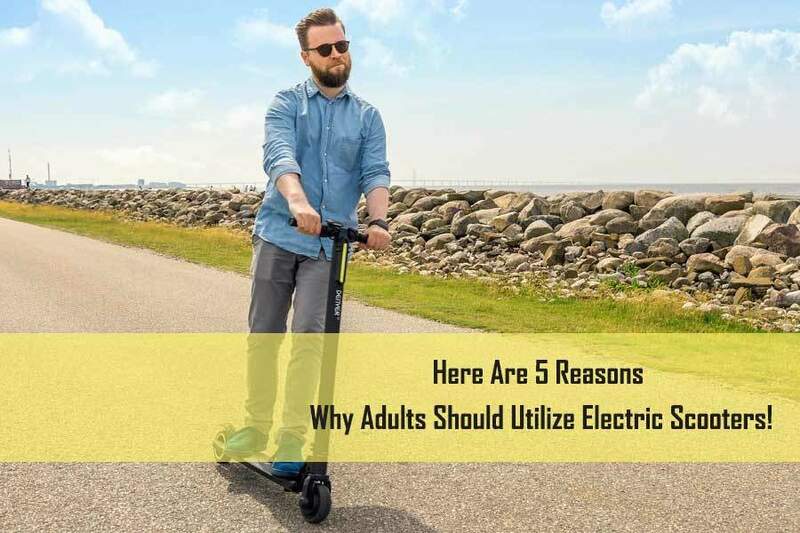 However, using an electric scooter, you could cut it down to just a couple of minutes. This not only saves you valuable time but you can also splurge yourself with a bit longer sleep in the morning. During peak hours, a short 4-6 mile car trip can easily become a frustrating one-hour ordeal. But with an electric scooter, you can avoid all that frustration. A scooter might be slower than a car, not in all cases, but none the less it will definitely save you time. And more importantly, it will get you right to the office door. Additionally, you will not be bothered with searching for a free parking spot. Just slip the 2-wheeler into the bike rack or fold it up and put it underneath your desk. Check out our travel time comparison on the image above. It illustrates the time saved using an electric scooter on a 1 mile trip to the bus stop. 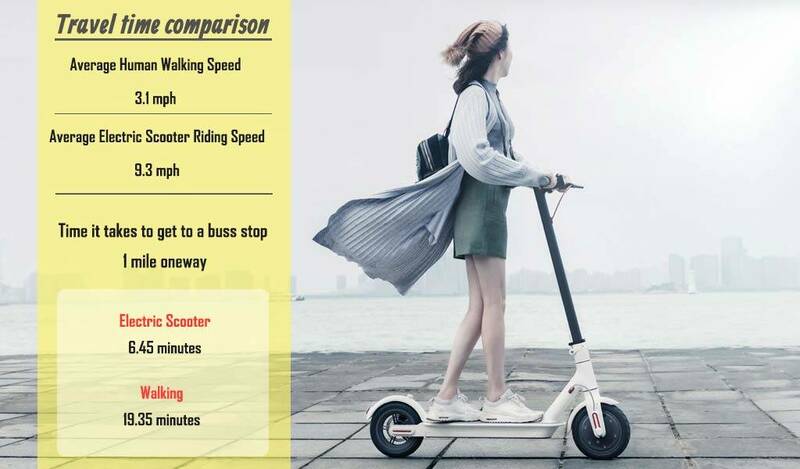 You would get there exactly 3 times faster using an electric scooter with the average riding speed of 9.3 mph, in comparison with the average human walking speed of 3.1 mph(according to Wikipedia). The typical electric scooter comes with a host of elegantly designed features, such as the trolley function seen on the Glion dolly model here. Combined with their low weight it makes them highly portable and you can pretty much take them with you wherever you please. They fit into most car trunks and go under the seat on most public transportation. Often you’ll be surprised by how tiny yet powerful they can be. The speed of these lighter units might be a tad slow, but if you need to go further aim for one of the somewhat heavier units. They have far superior speed and distance. Many electric scooters are designed with adjustable seats to match your own comfort needs. Most have shock absorbers that maximize breaking and acceleration effects, as well as facilitating a smooth ride when on rough roads. They also require less physical exertion to steer and maneuver. Because they require less storage or parking spaces, they will give you less stress. They enable you to enjoy the sun, cool breeze, and fresh air as you ride, which are good for relaxing the body especially after a hard day at work or to wake you up in the morning. One of the biggest upsides of owning one is that you can solve one very tricky situation. When with your car, you still have to leave it some distance from the office and walk that “last mile”. A similar challenge when using public transport is how to cover the short distance between the tram station and your office or home. This is where the electric scooters step in to help. It literally takes you to the doorstep of where you need to be, effectively solving that “last mile” problem. 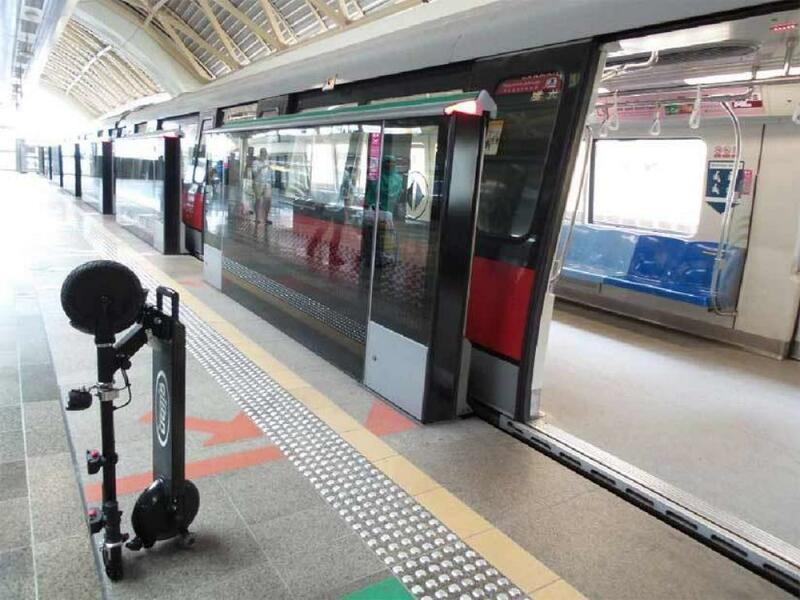 Additionally, if the distance to the office is too great to be covered on your electric scooter, you can ride it to the train/tram station or bus stop. Because they are electric-powered with no combustible liquids, they can be legally carried on the bus or train with you. Once at the workplace, simply fold it up or store it in a small space until it’s time to leave work again. Besides the low price of getting an electric scooter, these are vehicles with low maintenance costs and minimal repair needs. When you have a high-performance battery powering your 2-wheeler, you avoid high gasoline prices. Their battery-powered systems usually experience fewer problems compared to what you would encounter with gasoline engines and they hardly ever need any repair. The high-tech batteries are reliable, very durable and will tolerate many recharges. Combined with their lightweight and compact sizes, electric scooters are easy to store or park if the need ever arises. Majority of electric scooters can be folded up and taken with you for storing just like you would do with an umbrella. Electric scooters come in sleek designs with numerous safety features geared to serving older folks. Adults will appreciate the trouble-free riding provided by these scooters. You can literally use the scooter to go anywhere you want and at any time, no matter the type of surface. However, it’s important to acquaint yourself with how they are operated and the applicable local laws before you make the final purchase decision. Xprit Electric Scooter review – Bargain or trash? Riding skateboards since he was 7 years old never getting any good at it he started to compete in snowboard back in the days until he graduated as a car technician in 2008. The love for speed and adrenaline took over again when he got his first electric ride in early 2015 and since then he hasn’t looked back. Today he owns one of the largest e-ride stores in Sweden. He has gained traction through Youtube and for being featured in the media multiple times both in the US and Europe. He’s still worthless at skateboarding though. We love what we do here at EnvyRide and electric ridables are a passion close to our hearts. In order to pay for time invested and all the costs of EnvyRide some of the articles on our site has affiliate links, mainly to Amazon.com. What this mean is that if you purchase something through an affiliate link on our website we earn a small comission. It doesn’t cost you anything extra as a buyer. All it does is help us fund more sweet rideables to enjoy and review. Envyride.com is a participant in the Amazon Services LLC Associates Program, an affiliate advertising program designed to provide a means for website owners to earn advertising fees by advertising and linking to amazon.com any other website that may be affiliated with Amazon Service LLC Associates Program.